So let's take another look at that Smith and Pigott voting phenomenon. If they are the Court's centrists, but are not the swing votes, not the Judges most frequently in the majority, do they at least vote together very often? When they do vote together, does that asuure or virtually assure a majority? Overall, how frequently are they together in the majority? And how do they compare with other ideological pairings on the Court? 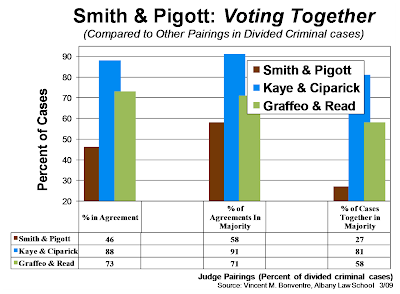 As depicted in the graph, Smith and Pigott have actually been voting together less frequently than have the liberal (more pro-defendant) pair of Kaye and Ciparick, or the conservative (more pro-prosecution) pair of Graffeo and Read. Curiously, as the Court's ideological centrists, not only have they been voting in the majority less frequently than their more liberal and their more conservative colleagues, but they have also been voting less frequently with each other than the other pairings have. So they are independent and contrarian (to borrow a term used by Smith himself) not only with Court majorities, but between themselves as well. So, liberals Kaye and Ciparick (at 88%) and conservatives Graffeo and Read (73%) voted together at much higher rates than did Smith and Pigott (46%). (Again, this is in the divided criminal cases over the 2 1/2 Court terms/years since Pigott joined the Court.) Moreover, of the cases where Kaye and Ciparick did vote together, a much higher proportion were majority votes than was so for Smith and Pigott. Likewise, for the cases where Graffeo and Read voted together, a higher proportion were majority than was so for the Court's centrists. More specifically, as the graph indicates, of those cases where Kaye and Ciparick voted together (remember, that's 88% of the cases), they were doing so in the majority 91% of the time. For Graffeo and Read, of the cases in which they voted together (remember, 73%), they did so in the majority 71% of the time. As for Smith and Pigott, however, in the cases they voted together (remember, 46%), just a little more than half of those--58%--were in the majority. The last item reflected on the graph--which really flows from the foregoing--only underscores further that, although they comprise the Court's ideological middle, Smith and Pigott are hardly the Judges who determine the Court's majority. When Kaye and Ciparick have voted together, they have helped to form a majority in fully 81% of all these divided criminal cases. When Graffeo and Read have voted together, they've had the majority 58% of the time. That figure may be much lower than Kaye and Ciparick's rate, but it is still more than half the cases--and more than double the rate for Smith and Pigott. When those two have voted together, they managed a majority in only 27% of the cases. So.... It all adds up to what we've now repeated several times about Smith and Pigott. Centrists, yes. Majoritarians, no. Now, before closing, let's be absolutely clear about something. It's very important to avoid any misconceptions about what the data shows and about what we (yes, I) might be suggesting. None of the foregoing--at least not in my view--suggests that Judge Smith or Pigott have been right about the law less frequently than other members of the Court. Let's state it another way. There is--again, in my view--no, none, zero correlation between the frequency of being in the majority and the frequency of being right or wise or prescient or anything else good--except being on the side that won. And even regarding the latter, the side that won only at that time. But not necessarily in the long run. Indeed, there are more than a few decisions of the Court in which it seems to me that the Judges outside the majority had the better view. Actually, plenty such decisions. So if Smith and Pigott are in the majority in fewer of these tough, divided cases more than their colleagues, that to me says not a wit about whether they were less frequently right or wrong, wise or foolish. There were certainly other Judges in the recent past who were less frequently in the majority (i.e., more frequently voting against the majority), and they seemed clearly (to me) to have had the much better view of the law than the majority. In fact, most of the time. Judges George Bundy Smith and Matthew Jasen are 2 that come to mind. (A liberal and a conservative, you might note. This is not ideologically based.) Both seemed to get it right case after case after case, despite being on the wrong side of the majority. Even Judges who were part of the majority more frequently, like Judith Kaye and Stewart Hancock. When either of them opposed the winning side, there was very good reason to doubt the Court's decision. And by analogy, on the losing side on the Supreme Court, need I say more than Holmes and Brandeis. Enough for now. Smith and Pigott. Two fascinating Judges with fascinating dynamics on the Court.